Q: We encountered long-distance network construction problems in the company, such as office buildings too long, and the internet access point on the other side of the building, to ensure that each floor has internet access and also fast, How to solve? A: Balanced twisted pair support for data applications is 100 meters, which is defined by international standards. The transmission of network signals over a distance of more than 100 meters will depend on the performance allowance of the cabling system, the performance allowance of network equipment, the construction situation of the site and many other uncertainties, it is difficult to get a quantified index and the transmission distance can not be guaranteed. 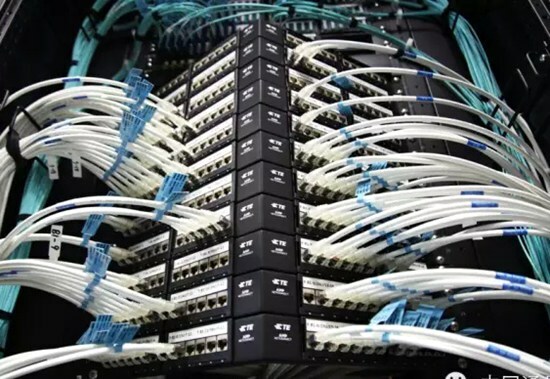 For your case, the standard approach is to set up two telecommunications rooms on a floor, the horizontal cable division area to the corresponding telecommunications room, to ensure that the horizontal link (from the patch panel to the information outlet) length is not surpassed 90 meters. Of course, you can also use high-performance grade, good quality cable, and module to do a direct point-to-point connection (more than 100 meters), but this line of network application support is not guaranteed, that may support xDSL or 10BASE-T signals, but may not be able to support higher rates. Wiring design standards need to follow, if the distance is too long, you can consider adding a relay in the middle, such as with a switch or hub to connect two lines. Do not risk exceeding long-distance transmission, which can cause uncertainty in network communications. Q: What are the special requirements for Fiber Channel cabling in the data center? Transmission distance: OM3 multimode fibersupport 300m-550m, single-mode fiber support 10-40km, use the use of an optical fiber connecting devices and adapters with SC, LC connector or in accordance with the type of network equipment. The position of the Optical Distribution Frame: such as the top of the equipment cabinet, the open Bridge, the wiring column head cabinet and all kinds of wiring cabinet. Q: Our Company has a total of 3 floors of buildings, each floor has 80-100 computers, each floor of computer distribution area of more than 300 square meters. Like this case, how can I do to do more simple and effective completion of cabling layout? The current plan is to place a 3-layer switch in the central area of each floor, then connect the 3 switches through the PC server to achieve network sharing, and then implement Internet access through the router. Is that okay? The Wiring network architecture is suitable for the structure of the computer network; the setting of the floor wiring note that the horizontal cable does not exceed 90m length; the rank of the cabling system is in line with the transmission bandwidth of the Ethernet switch. The proposed level uses the Cat5e class or the Cat6 class wiring system, the trunk uses the multimode fiber (OM3) and configures the corresponding wiring module. You should design the more detailed wiring system diagram, and identify the Internet facilities and interconnection relationship. Q: POE power supply is used in the four lines of cable to transmit electricity, then the 100M line is easy to achieve, but the Gigabit is to use eight lines to transmit the signal, is not a Gigabit port mode can not achieve POE Powered? A: There are two types of POE power supply: one is two pairs of line transmission of information, two pairs of line power; another way is to transfer information on the line and transmission power. POE power supply mainly depends on the function of network equipment, the transmission line is no problem. Gigabit Ethernet follows the IEEE802.3ab standard, which supports enhanced cabling systems over 5 categories, and if the components of your cabling system and the entire channel conform to the Cat5e Standard, you can support the Gigabit either in terms of A or B. Gigabit Ethernet is full duplex running on the 4 line, the current market has not seen half duplex Gigabit network equipment. PoE is divided into endpoint and mid-span two modes, an endpoint is powered by the switch port, end-span is loaded in the middle of the line power, and now the two modes are supported in the data line to load the power signal, the market offers those two models of the Gigabit products. There are two Gigabit interfaces: 1000BASE-T and 1000BASE-TX. They will use four pairs of lines but in a different way. 1000BASE-TX, is two pairs of 500M send, the other two pairs of 500M receive, so can reach 1000M Full-duplex (2000M throughput). This interface requires Cat6 cables to support. 1000BASET-T is four pairs of incoming and outgoing 250M, also can do 250*4, 1000M full duplex transmission. This interface is available in both Category 5 and 6 cabling. Now, most of the equipment interface is 1000BASE-T.1000BASE-T device interface cost slightly higher than 1000BASE-TX because 1000BASE-T equipment interface requires crosstalk elimination technology. Q: In the access network area, how about the CATV development in the future? Is there a trend to replace ADSL? A: CATV generally use HFC fiber optic copper hybrid access technology, it can support cable television signals, voice, data and other information transmissions. It can also achieve the integration of business networks, but from the current national industry-related laws and regulations: CATV network mainly applies cable television network. ADSL is also a copper access technology, it can also achieve multi-service access, but now it is mainly used in voice and data services, telecommunications operators is a broadband access. All access technologies such as the current use of EPON can achieve business integration, so technically can be achieved, a variety of technologies have their own characteristics, can not completely say who can replace who. Q: What is ‘short link resonance’? A: This is a good question about cabling design standards and product optimization. You mentioned that the short link resonance is said that when the link is shorter (less than 15 meters), the unbalanced signal or noise generated by the link is superimposed, resulting in a communication failure (the shorter the link between the connectors Signal reflection is easier to superimpose). We all know that the permanent link to less than 90 meters, but the standard also requires more than 15 meters, so you can avoid the ‘short link’ problem. That is, when the link between the two patch panels or modules is shorter than 15 meters, the link test will often fail. This phenomenon in the super five and six cable systems will often appear, we usually ‘short link’ problem. However, the problem is not so terrible, some manufacturers do their own products to optimize the processing, or signal compensation technology, making the short link, but also to achieve the appropriate performance. For example, it can be used at 7 m or less. At the same time, the tester manufacturers are also testing the adapter to optimize, to adapt to changes in cable products. Everyone needs to know is that the link is not as short as possible. Q: Now the entire network has been a good line, detection all through, but after a period of time, connected to the PC Display network disconnect, with the detection of all the wire detector, why? A: The acceptance of integrated wiring should use professional wiring test equipment, and should not use a simple on-off tester. Professional equipment in addition to off and line order, but also detect insertion loss, crosstalk, return loss, delay and other electrical performance parameters to help you determine whether the wiring system installation is acceptable. Q: Our company has nearly 200 computers, want to control the network storm, whether to be placed on each floor, three switches to do VLAN, or first connected to the general switch, and then unified to a main three-layer switch to do VLAN. A: Of course, the first way is better, but will increase the cost. And if you divide the VLAN very finely, you need to increase the routing, because the host between the VLAN and the VLAN is not able to communicate. the second main can also be adopted, to prevent broadcast storm there are many, not only in the VLAN division of a way. Q: What is the specific style of the computer room cable label? What kind of material? Is there a uniform requirement? Is there a relevant specification? Is there a bibliography that can be consulted? A: The application of the label should mainly consider the expression of the logo, presentation, and selection of the label material. On the requirements of the label, International is mainly TIA/EIA606 standards.You can contact to purchase. Q: I would like to ask the question about factory fiber cabling, is there any notes? What are some of the standards for fiber optic cabling and how to distinguish between single mode and multimode fiber? Thank you! If the installation of routing in the encounter high temperature, vibration, corrosion, flooding, extrusion, dust and other environments should try to avoid and maintain the appropriate spacing; the use of closed metal wire or steel pipe corrosion cable, the bending radius of the pipeline should be greater than Fiber optic cable diameter of 10 to 15 times; outdoor cable should be used grid-like plastic pipe laying, and the use of non-metallic components of the outdoor cable; fiber connection device shell or fiber optic wiring box set in the operating area, should be protected Measures, the level of protection should meet the IP requirements, generally reach the IP67 level. Technical requirements for fiber optic cabling networks can refer to the relevant standards of the communications industry. Fiber cabling system engineering is a whole, including fiber optic cable and fiber optic connection devices. Fiber optic cable according to the diameter of the fiber is divided into multimode and single-mode fiber (multi-mode 62.5 microns and 50 microns, single mode is about 9 microns). Different wavelengths of optical fiber used in the nominal value are not the same, there are 850nm, 1310nm, 1550nm and so on. Only by virtue of the naked eye can not distinguish between multimode and single-mode fiber, should be based on product manual to choose. (1) to meet the network equipment, optical port transmission rate (100Mbps, 1000Mbps, 10Gbps); (2) transmission distance.